Newly released documents make a strong case that the fashion icon may have been leading a double life. It may seem like something ripped right out of a movie: a famous, glamorous fashion designer and perfumer secretly taking on missions for the Nazis during the Second World War. Gabrielle “Coco” Chanel was synonymous with haute couture and appeared to have lived a rather charmed adult life, so is it possible that she would align herself with the Third Reich? In 1933, Joseph Goebbels, the Reich Minister for Public Enlightenment and Propaganda, would appoint an Abwehr spy by the name of Baron Hans Gunther von Dincklage to the position of “special attaché” to the German Embassy in Paris. In Paris, von Dincklage would meet — and become romantically involved with — Coco Chanel. The two moved in together, living for a time in Paris’s Ritz Hotel. A source from Madrid informs us that Madame Chanel, in 1942-1943, was the mistress and agent of Baron Gunther Von Dincklage. Dincklage was the attaché to the German Embassy in Paris in 1935. He worked as a propagandist and was a suspected agent. The French language documentary called “L’Ombre D’un Doute — Paris and Les Artistes sous l’Occupation,” which aired in late 2014 on French television channel France 3, detailed Chanel’s involvement with the Nazis. The documentary revealed, through more examination of the French Ministry Documents and official Nazi documents, that Chanel was a Nazi spy code named “Westminster” — a reference to her previous connection to the Duke of Westminster. 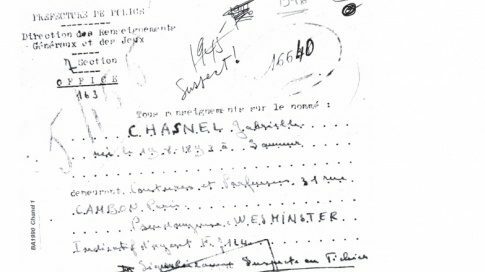 Chanel was such a real part of the Nazi Abwehr that she was even given an agent number: F-7124. 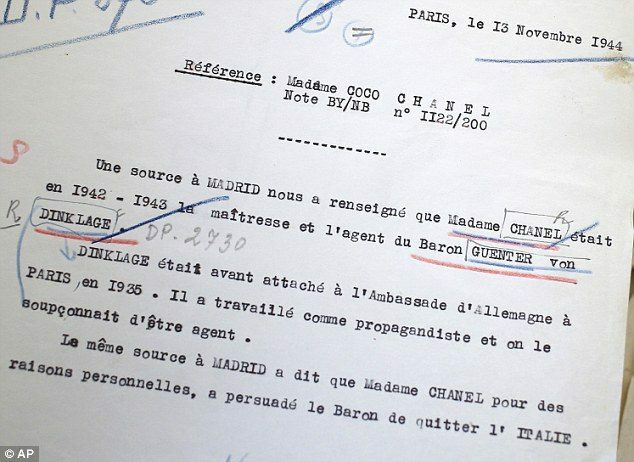 According to the files, Chanel was reportedly groomed for one major mission in particular, and that was dubbed operation “Modelhut” (which translates to “model hat”). This mission was reportedly detailed to Chanel by the infamous Heinrich Himmler himself during a personal meeting the two had in Berlin. In 1943, Chanel took a trip to Madrid with Baron von Dinklage; she was to deliver a personal letter to her acquaintance, Britain’s prime minister Winston Churchill. The purpose of the letter was to persuade him to end hostilities with the Nazis. Why did Chanel work with the Nazis? It is often assumed that she held a prejudice against the Jews. In reality, there are no quotes by her or any actions that she took that would indicate she was in any way an anti-Semite. However, she did have one major instance of sour feelings with a well-to-do Jewish family, the Wertheimers. In 1924, Chanel was looking to expand her empire and reach, but she required some financial backing. A Jewish businessman named Pierre Wertheimer gave her the backing that she needed, but took the majority of the stock for himself —— leaving her with a meager 10 percent stake in her own company. This contract left Chanel bitter for many years, to the point that she even appealed to the Nazis for control of her company during World War II. In the 1930s, the Nazis began to pass laws that would “Aryanize” the businesses throughout Germany and any area that the Germans occupied. The 1935 Nuremberg laws made it impossible for any Jew to own a business in Germany. This “Aryanization” was well underway by 1941, as nearly two-thirds of all Jewish-owned German businesses had by then been “sold” to non-Jews for a cost that was well below market value. Chanel’s efforts were unsuccessful, since Wertheimer had the foresight to transfer the business to a non-Jewish friend before he fled. She was unable to legally obtain control of the company, much to her chagrin. The House of Chanel remains firmly in the control of the Wertheimer family to this day. What’s certain is that she had a relationship with a German aristocrat during the War. Clearly it wasn’t the best period to have a love story with a German even if Baron von Dincklage was English by his mother and she (Chanel) knew him before the War. While the evidence appears to skew strongly in favor of Chanel’s at least doing some information gathering for the National Socialists, it is important to note that none of this has ever been officially confirmed. Sleeping With The Enemy: Coco Chanel’s Secret War. New York: Random House. 2012. ISBN: 978-0307475916. Daily Telegraph. 26 September 2013. New York Times. 2 September 2011.